This March 25/26th Tele Vue will again visit the All Arizona Messier Marathon — 2-hours west of Phoenix, AZ. Look for John Rhodes at the Tele Vue banner. Did you know about the loaner program? 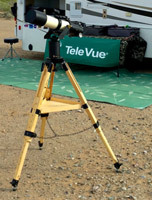 John can loan you Tele Vue equipment to use for the night. It’s the ultimate try-before-you-buy experience! The organizers will make available a limited number of certificates and plaques for your Messier object observation and imaging efforts. Special certificates and plaques for under-18 participants. Our TV-76 & TV-85 scopes, mounted on our Tele-Pod & Panoramic mounts are excellent for transportation to dark sites for casual or marathon viewing of all the Messier objects. Next Next post: Tele Vue Upcoming Live Events!